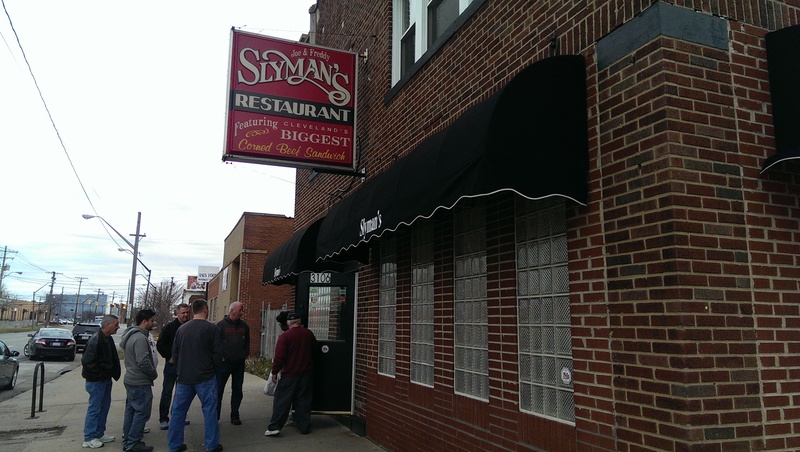 Is there anything more quintessentially Cleveland than Slyman’s? Would you believe that I (a native Clevelander) had never been here until a couple months ago? 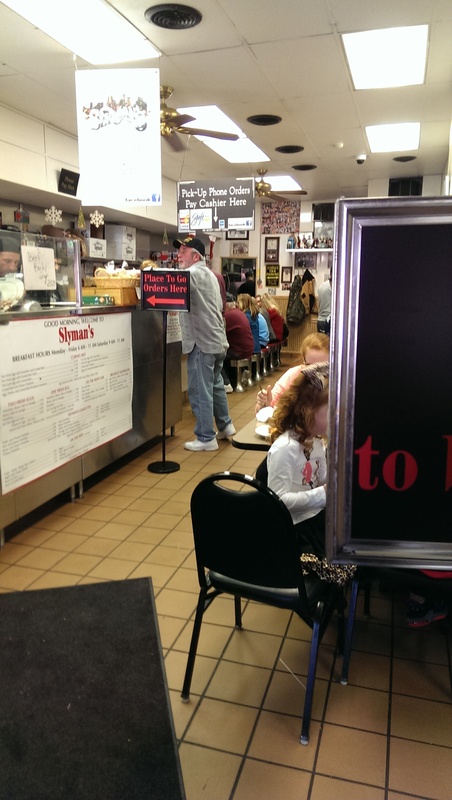 Whenever people talk about “musts” in Cleveland a corned beef sandwich at Slyman’s is always on the list. The sandwiches are monstrous. There is a reason they offer a side of bread on the menu – to make another sandwich with whatever falls off the monster you are currently eating. The carry out line is usually longer than the dining in line, with downtown workers grabbing their food to go eat at their desks. The place is tiny and cramped, but service is exceptionally quick. They have their service down to a science – a very efficient science. This place is a family-run institution. They celebrated 50 years in 2013. Joe and Mae Slyman opened the restaurant in 1963, and now their sons are working behind the counter, slicing the meat and grilling the sandwiches. 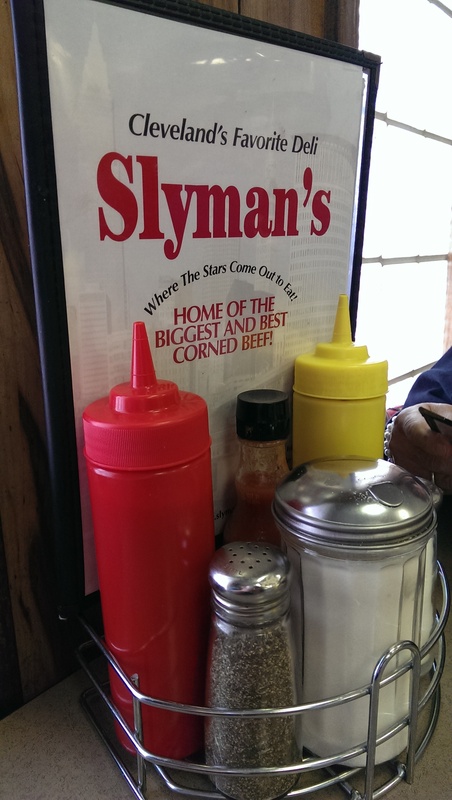 Slyman’s is located on St. Clair Avenue at E. 31st Street. You can park along St. Clair and E. 31st, but there is also a parking lot across the street off E. 31st. One reason I had never managed to make it here before are the limited hours and the talk of long lines. They are only open during the week until 2:30 and on Saturdays until 1:00. They aren’t open on Sundays. I finally made it here for the first time on the Saturday afternoon after Christmas. I figure it would not be as crowded as it normally is, and I was right. There was still a line, but it moved quickly. They were able to seat our table of 3 quickly in the small dining room to the right of the door. Once we ordered our food, service was even quicker. I don’t think more than 5 minutes passed before our food was brought to the table. 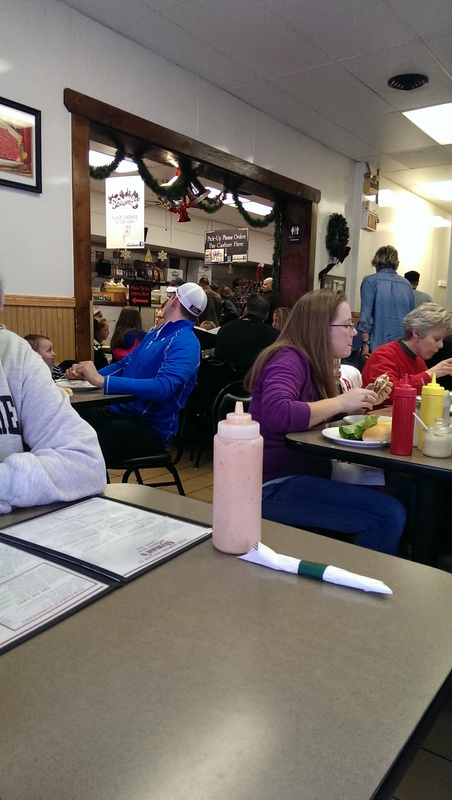 Since Slyman’s is known for their corned beef, I had to get a corned beef sandwich on my first outing. I ordered a Reuben. The Slyman’s Reuben is not like any other Reuben I have ever had. It is 99% corned beef with just a bit of sauerkraut and one slice of Swiss cheese on the top and bottom. That said, it was pretty damn delicious. 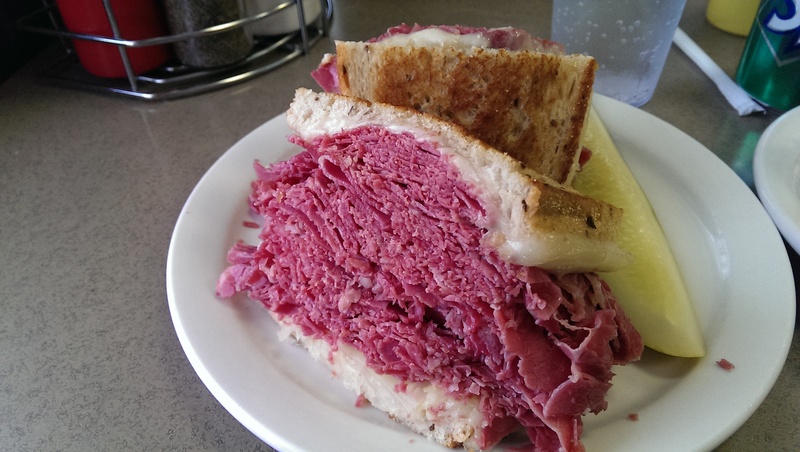 The corned beef is not too salty and is shaved very thin and piled high. If you are not a fan of sauerkraut never fear. It doesn’t overwhelm, and I can’t see it in the sandwich. I think there might be a thin layer at the bottom with the cheese. The rye bread is buttery and crisp from the grill. They don’t put condiments on the sandwich. The ketchup, mustard, horseradish, hot sauce and Thousand Island dressing are on the table, which allows you to doctor it up just how you like it. I ordered a Sprite and a side of potato salad to go with it. The Sprite came in a can along with a small glass of ice. Order two right off the bat if you are particularly thirsty that day. And since corned beef tends to be somewhat salty you might need it. The potato salad was out of this world. It was creamy and had small shavings of carrot and onion. It was not overwhelmingly mustardy if you like that kind of thing. If you do, just add a splash from the table condiments. 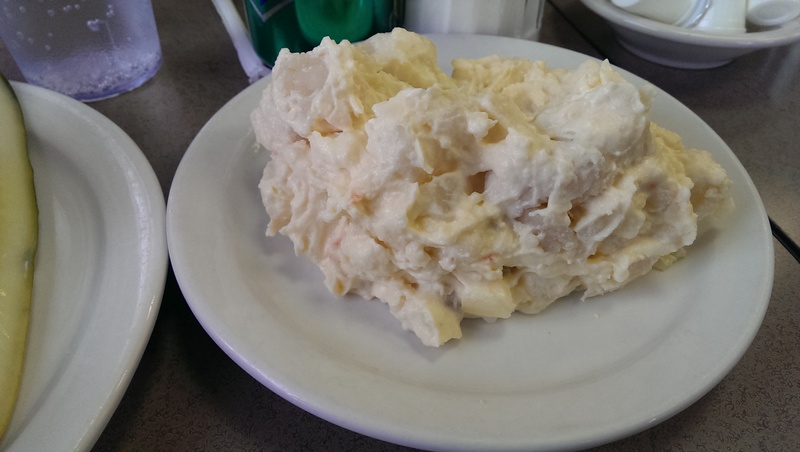 It was just a good, solid potato salad that I would happily order again. My dining companions ordered the french fries, and they were really good for food service fries. The serving size was plentiful, and the crinkle cut fries were crisp on the outside and soft and fluffy on the inside. On my second visit I was craving a Tuna Melt. 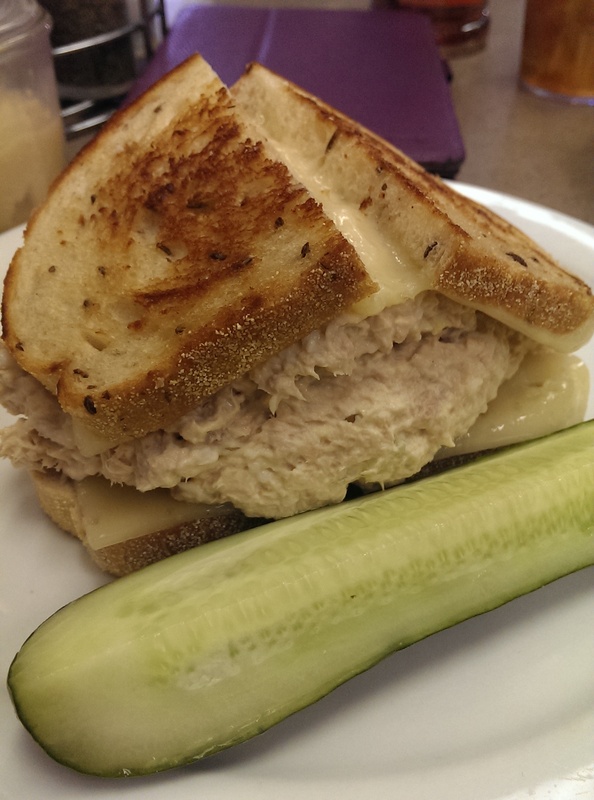 I had heard good things about the tuna melt, and the tips did not steer me wrong. This was a delicious tuna melt. I ordered it on the requisite rye bread with Swiss cheese. I wanted to have soup, but the choice that day was beef barley, which isn’t necessarily the best accompaniment. Potato salad it is! The tuna melt and potato salad were delivered within one minute of ordering (I kid you not). I also can’t believe I ate the whole thing! I didn’t eat for the rest of the day. You can also order roast beef, pastrami, turkey, ham, egg salad, salami, BBQ beef, a hamburger or cheeseburger, hot dog, patty melt, grilled cheese and several salads. 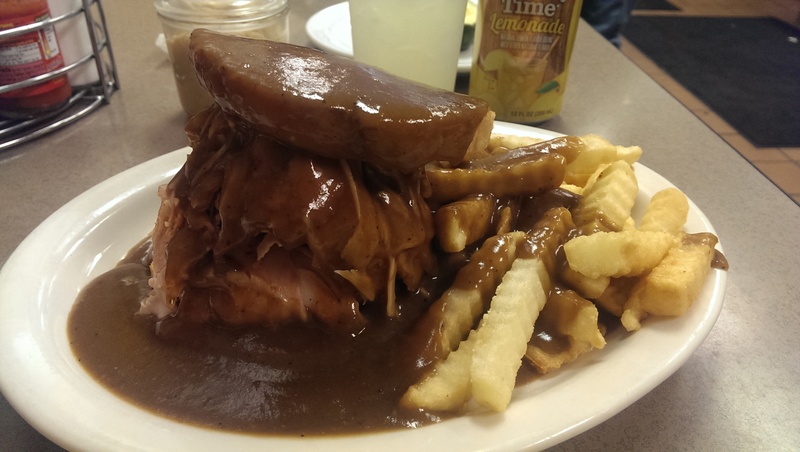 If you really want a challenge, their hot turkey (below), hot roast beef or hot BBQ sandwiches are served closed face along with home fries or french fries and come smothered in gravy. If you come here and know you won’t be able to finish your sandwich, you might want to bring some kind of container with you. They bring you parchment paper to wrap up your sandwich, but it doesn’t work real well if you have a wet item like potato salad, cole slaw or tuna fish. Breakfast is served from 6 am to 11 am on the weekdays. I have a friend from high school who raves about their corned beef hash. I’m tempted, but let’s be honest – I am likely to never make it here for breakfast. If you do be sure to order the corned beef! There is a reason they bring your food so quickly. With space at such a premium you are not encouraged to linger. Order, eat, and get out to make room for the next person. Don’t take it personally. People are clamoring to get in here. They just opened a Slyman’s Tavern on Rockside Road in Independence, and it seats 150. It is open every day from 11 am to midnight. Maybe it will decrease the crowds downtown, but I doubt it. If anything it will satisfy all the cravings of all business folks in Independence. I’ve still never been, but this has GOT to change. Thanks for the reminder. Pro Tip: Order extra bread so you can split up the corned beef and have an extra sandwich for lunch the next day…or later that night!